Innovative foundations, turbines and cables are being tested at the five-turbine 41.5MW site approximately 6km off the north east of England. MHI Vestas’ V164 8MW turbines, which have an uprated power output of 8.3MW, have now been installed on concrete gravity-base foundations designed and built by the Dutch construction firm Royal Bam Group. 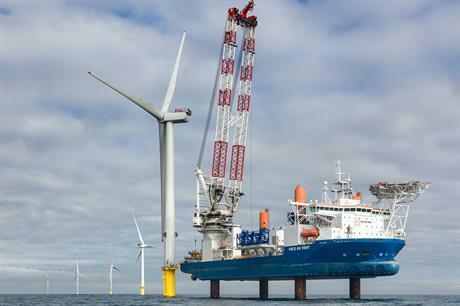 The turbines — the most powerful to be used on an offshore wind project to-date — were lifted and fitted onto the foundations using a specially designed jack-up vessel. The uprated turbines have been connected to around 11km of buried 66kV offshore cables — twice the capacity of the current cable standard of 33kV. The cables were installed by Dutch marine specialists VBMS. Sensors have also been added to two of the foundations to monitor conditions and collect performance data. According to ORE Catapult, it is the first time this technology has been tested on gravity-base foundations. The project’s foundations were installed over the summer after being floated into position, submerged onto the seabed and ballasted to provide further support. The ‘float and submerge’ process demonstrates the "potential for self-installing concrete gravity bases in deeper water", the Royal Bam Group had said. EDF Energy Renewables CEO, Matthieu Hue, said: "The completion of the wind farm is one step closer now that we have achieved this latest milestone. "The turbines, the foundations, and the cable are innovative features of this project, which is playing a major role in testing and proving new and emerging offshore installation methods and technologies." EDF Energy Renewables acquired the rights to the Blyth test site from the seabed landlord, the Crown Estate, in October 2014. The site has the consent to install up to 99.9MW of capacity. After acquiring Blyth, EDF Energy Renewables said it would use the project to "grow its expertise and experience in designing and choosing foundations" and develop offshore installation processes. The Blyth demonstration is expected to start generating power later this year, EDF added.